In December 2017, I presented information on the risk of the transboundary spread of foreign animal diseases through contaminated feed at the University of California Davis College of Veterinary Medicine. The audience included the FBI Weapons of Mass Destruction Division, the California Department of Agriculture along with several faculty from UC Davis vet school. The FBI took particular interest in the role of feed ingredients as a means of potential agro-terroristic attacks on the US. The Bureau had discussed the idea for several years and the Pipestone data supported the hypothesis that an attack of this type could possibly occur. The information presented from Pipestone was considered new intelligence to support the concept of “purposeful” agro-terrorism. The Bureau was very appreciative of Pipestone’s willingness to share their information for the purpose of serving the greater good. Pipestone’s current project on mitigating the risk through feed additives was of high interest and will continue to be explored. Overall, the meeting was a success and laid the foundation for further collaboration between the FBI and Pipestone as an opportunity to further protect our US food supply and independent farmer clients we work for. 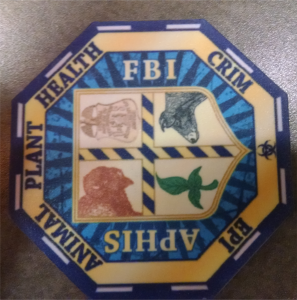 When I was a 5-year old boy dreaming of becoming a veterinarian, I never would have thought I would ever work with the FBI! As a gesture of their appreciation for the new intelligence, the Bureau presented me with a “Warrior Chip” (pictured below). This entry was posted in home, Latest News, News Category1. Bookmark the permalink. Well done Pipestone and Dr. Dee! Most people probaly want to avoid being noticed by the FBI. To have the value of your investigations to national security be recognized by a department of master investigators is quite an accomplishment.